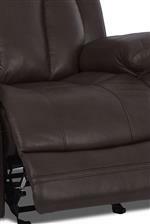 This power reclining loveseat console can provide seating and functional storage in your living room or family room. 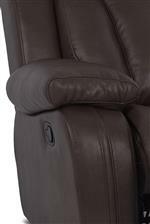 The two reclining seats allow you to sit back and relax while propping up your feet and legs on the padded chaise. The cup holders and storage console allow you to store items safely. The Atticus-US Casual Power Console Reclining Loveseat by Klaussner International at AHFA in the area. Product availability may vary. Contact us for the most current availability on this product.